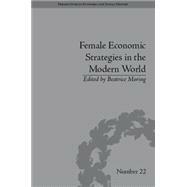 This collection of essays looks at the various ways in which women have coped financially in a male-dominated world. Chapters focus on Britain, Europe and Latin America, and cover the whole of the modern period. The central argument of many contributors is that, far from some accepted stereotypes, women throughout history have not been passive in dealing with their economic needs, and that older women in particular had more agency than has previously been assumed.